When it comes to the massive task of renovating your home, you want to be sure that you have everything in order before you begin. This includes having the right skip bin at the ready to dispose of waste as it appears. We all know the significant value renovation adds to your home, and we’re here to ensure that no mess is left behind once it’s complete. At Matt’s Skip Bins, we have a large selection of bins to choose from. Our mixed building waste bins can handle all building materials, including tiles, bricks, gyprock, timber and flooring. It is important to know what you can and can’t throw out. If you are doing a residential demolition, these materials may also be mixed with garden or green waste aswell as general household waste. Prior to booking a skip, we will speak with you about your choice of bin and what can be thrown out, based on your needs. How Long Can I Book the Bin For? We have two options when booking a skip – either a 5-day hire for general household cleanups or up to14-day hire for building waste projects. However, if you are finished with the bin earlier than expected or require an extension, give us a call before the booked collection date and we’ll work with you to accommodate your needs! Unfortunately, many older homes were built with materials containing asbestos. This nasty chemical has caused significant health problems to many people across Australia and must be removed with caution. If you are throwing away asbestos or any other hazardous chemicals, you will need a separate bin. Just like our mixed building waste skips, you can hire the skip for up to 2 weeks but please take caution when handling the material. When undertaking a home renovation in Sydney, it is important that you have the right skip bin. 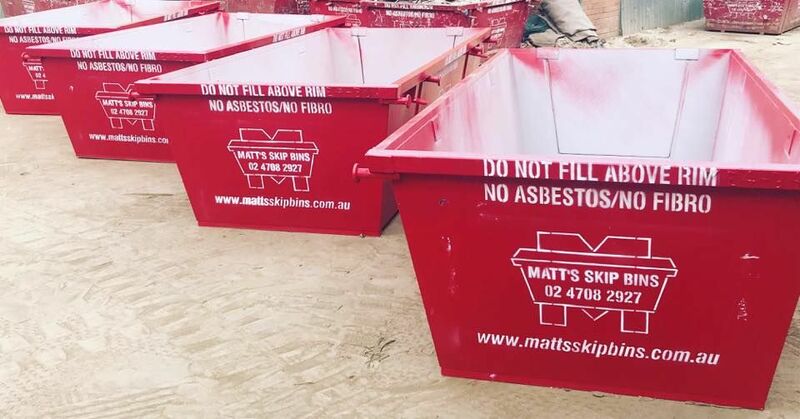 If you are starting a renovation and would like to know more about our bins, get in touch with Matt’s Skip Bins today. Call us on (02) 4708 2927.